Because a photo of compost is boring. Huge earthworm found here. In follow-up to last week's post on restarting the compost bins, I've put together a list of compost do's and don'ts that may make the whole process a little easier. Again, I am no composting expert and much of what I say is probably quite unscientific, but it is a record of things that have/have not worked for us. compost human waste or dog/cat poo. for basically the same reason as above. If I think of anything else that's similarly important, I'll be sure to add it to the site. And if you've got any questions let me know - I may not know the answer but I could likely find out. 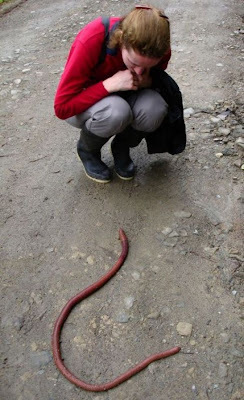 Absolutely awesome picture of an earthworm. I love it, wish we had those in our compost. :) Good luck with composting.